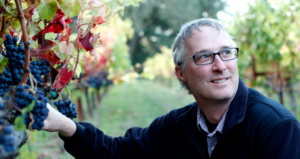 Mike started his winemaking career under the direction of Thomas Brown in 2001. Traveling from Portland Oregon, Mike worked each crush “free of charge” to learn his craft. Following his 3rd harvest, Mike accepted a full-time assistant position from Thomas and moved his family to St. Helena. Today, Mike continues to work with Thomas on several labels (i.e. Rivers-Marie, Maybach and Tamber Bey). The Becklyn Cellars wines are custom crushed alongside these greats… showcasing Mike’s talents and stylistic “purist” approach to winemaking. In case you have not seen it, the Nov 15th issue of Wine Spectator not only has a special article about Myriad Cellars but also features Mike’s 2009 Carter Cellars Grand Daddy ToKalon on the cover. The article “Pursuing Their Dreams” highlights five top Cabernet producers in the Napa Valley. “The five vintners profiled have diverse backgrounds and interests, but they share the goal of dreaming big. And their hard work is resulting in some of the Best Cabernets in California today,” writes MaryAnn Worobiec, Wine Spectator. Adding that “Mike Smith has clients such as Quivet and Carter Cellars that have excelled under his wine-making hand. It’s clear the couple made the right decision. I’ve never met anyone more meant to make wine than Mike Smith.” This feature article can be found in the November 15th, 2012 issue of Wine Spectator. In 2012 Mike was extremely honored to be chosen for not one but three of his wines for the Flavor Napa Valley ‘Legends of Napa Valley Definitive Tasting’ at the Culinary Institute of America Rudd Center. “Never in a million years did I ever dream I would be making wines from the finest vineyards in Napa Valley” Mike humbly stated after a room full of applause. This three day event is a star studded celebration of amazing food, wines, chefs and winemakers and master sommeliers. Selected panelists Anthony Dias Blue, Karen Mac Neil, Alder Yarrow and Nicholas Jackson lead the tasting which included names like Harlan, Screaming Eagle, Paul Hobbs, Realm and many more. Mike was selected for his 2010 Myriad Dr. Crane, Carter Cellars ToKalon and 12C Vineyard Georges III Cabernet Sauvignons.